After 18 months of tears, miles, injuries, and small victories, the dream of crossing the finish line with a Boston qualifying time had finally manifested. I knew we had it during the last six miles of the race but I didn’t want to jinx how good I was feeling. It was the thought that “anything could happen in a marathon” that kept me superstitious till the very end. This past week, I reflected on every little detail of how race day unfolded. I reflected on my journey throughout the past year and a half, and how race day felt different from past races. How was it possible? How had this race finally put all the pieces together? The answer? It’s a combination of a bunch of little actions that turned into a huge result. I mean, you guys! I PRd by 23 minutes in the marathon! Prior to August, my training consisted of a monthly average of 68 miles, strength training, spin class and minimal speed work. 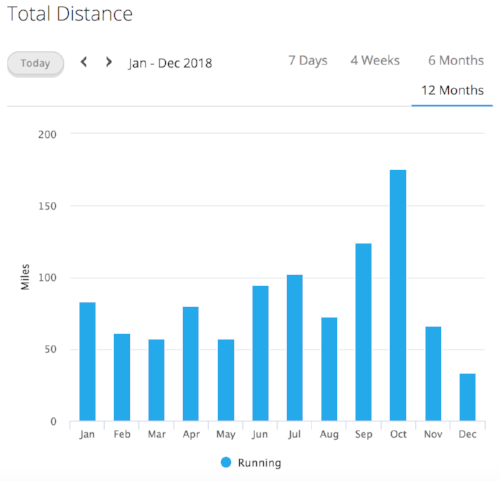 I’m attaching my Garmin Connect’s total distance report below for reference. In July, I felt defeated by the San Francisco Marathon. After months of training through a busy work travel schedule, I completed my 7th full marathon feeling physically weak and fatigued. I burned out of energy by mile 13 and decided to walk/jog the rest of the way until the finish line. Upon completing the marathon, I desperately wanted to change how I trained. Running marathons became a chore. I truly missed running with joy and enjoying the process of personal development. Joining the all women’s run club, Arete, gave me something to look forward to in the next training cycle. I was excited for Coach Mary’s expertise and the support of my teammates to help make training fun again. Week after week, Coach Mary kept my mind and body engaged by providing workouts I had never attempted before. Workouts consisted of easy miles, strides, track speed work, and long runs which included either progressive, marathon paced, or half marathon paced miles. I also strength trained twice a week and spontaneous signed up for spin class. Every day I showed up with a positive attitude. Though I was nervous about how I would complete the workout, I made sure to give my best effort on that particular day. I also tracked all my workouts in my Believe Training Journal gifted to me by a woman in the running community, and actively followed the practices within the journal shifting my mind to a more positive mindset. Out of all these, the one that stood out the most was Strong: A Runner's Guide to Boosting Confidence and Becoming the Best Version of You by Kara Goucher. Every day I practiced what Kara preached. I would use my mantra and/or power word when things got tough in a workout. Every day I would journal one positive thing about training that stood out. And finally my favorite part was to find 10 minutes out of the day to practice positive visualization. Every night before I went to sleep I would close my eyes and breathe slowly & deeply. I would then start visualizing every little detail about how race day would unfold. From waking up and getting dressed to the driving to the start line; every little detail was visualized in my mind. My favorite bit when visualizing was running the actual course. Thankfully I ran it last year, so I vaguely remembered the rolling hills and the bridge at mile 21. I would visualize how I felt climbing the last hill and absorbing the energy from the crowd as I neared the finish line. I visualized how tired my legs would feel and how I would use my mantra to combat it. I visualized crossing the finish line hands raised in the air. I visualized being a Boston qualifier. Little did I know that these daily practices made running the marathon ten times easier. Having imagined the worst scenarios and fatigue made running on race day feel like a breeze. I had practiced feeling strong and relaxed so I ran strong and relaxed. I practiced running up the hills feeling calm so on race day I ran up the hills feeling calm. I stayed present with every foot step in every mile. Like in meditation if my mind wandered, I brought it right back to where I was on the course. They say practice makes perfect but I say practice till the effort feels easier. I truly believed I could BE a Boston qualifier so I became a Boston qualifier. Yes I am!